Phenomenal signatures from 4 countries (see below)! Overall size: 29 1/8: x 23 1/2"
Image size: 26 1/4" x 19 1/2"
Towering clouds, the setting sun and softness of summer in the English country side. What could be more peaceful? There was a time, however, when that scene was pucntured by the sharp edge of war. It was during the Battle of Britain in the early days of World War II, and it is a time the world will never forget. 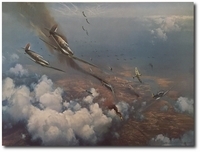 Although historians have largely concentrated on the aerial combat over London, there was an area south of the city that saw more than its share of action. 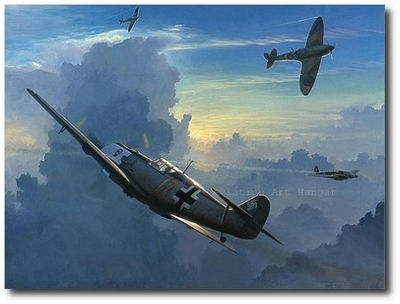 In fact, German and allied pilots met so often over a rocky promontory of land that the are earned the title "Hellfire Corner." It is the name William Phillips chose for his print. "I have had the opportunity to get to know the signers of "Hell Fire Corner," and it is hard to believe that they were once contestants in a deadly struggle. Each is a fine gentleman, and each has gone on to great achievements in the decades since after the war.